Home / Offers / Win tickets to see the new Sumatran Tiger cubs at Taronga Zoo! To celebrate the arrival of the three tiny tiger cubs at Tiger Trek at Taronga Zoo, we’re giving free tickets so you can see them while they’re still little and cute! Three Sumatran Tiger cubs were born at Taronga Zoo Sydney on Thursday 17 January 2019. With only 350 Sumatran Tigers left in the wild, these cubs are incredibly important, representing nearly 1% of the total wild population of tigers. These three cubs are settling into Tiger Trek with their mother, Kartika. Their father, Clarence, uncle Kembali and grandmother Jumilah make up the rest of the tiger family at Taronga Zoo Sydney. Tiger Trek is an Indonesian-themed immersive experience, providing an amazing opportunity for you to get up-close with these magnificent, critically endangered Sumatran Tigers and learn how simple shopping choices can help to preserve their precious, natural habitat. During your Tiger Trek experience, you will board your flight to Sumatra and be transported to the beautiful forests of Way Kambas National Park to see the magnificent Sumatran Tiger. Explore the village, and discover how we all have a role to play in saving this species from extinction by choosing Certified Sustainable Palm Oil. 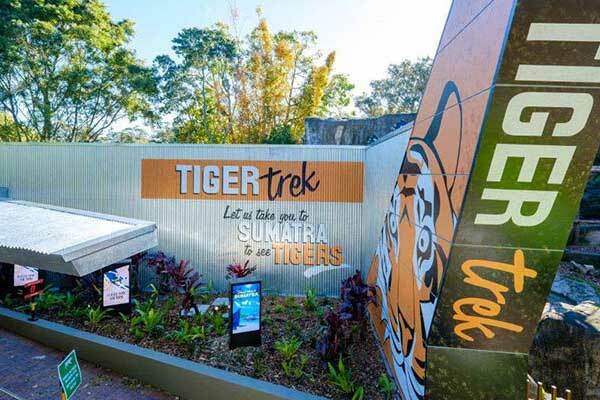 The Tiger Trek experience is the natural expansion of Taronga’s efforts to help save the Sumatran Tiger. To go in the running to win, simply take a look at our NSM Essential Guide to Kids’ Classes Term 2, and tell us the name of an event that is listed in the guide. Click here to view the Guide (don’t worry, it opens in a new tab, so you won’t lose this page!). Then, for a bonus entry, comment on the dedicated post in our Facebook group, Facebook page or Instagram post. Hurry, competition closes midnight Easter Monday. Would you like to receive our weekly newsletter? It's packed with the latest articles, events and special offers. We know you'll love it... but if you don't, you can unsubscribe at any time. Entry into this competition is by completing the online entry form on northshoremums.com.au. To enter, participants must correctly name an event listed in the NSM Essential Guide to Kids’ Classes Term 2. For bonus entries, entrants can also comment on the post in the North Shore Mums Facebook group or North Shore Mums Facebook page or North Shore Mums Instagram page. Maximum 4 entries per person (one each for website, FB page, FB group, Instagram). The competition opens 5.00pm AEST 15 April 2019 and closes 22 April 2019 at 11.59pm AEST. The major prize winner will receive a Zoo Friends Family Pass (2 adults, 4 children) worth $220. Five runner up winners will each receive a Family Pass (2 adults, 2 children) to Taronga Zoo, worth $148 each. Total Prize Pool value of $960. The winners will be randomly selected by a computerised system on 23 April 2019 at 12.00pm at North Shore Mums head office. The winners will be notified by email or Facebook. Next Story → Win 10 litres of your favourite gelato from Gelatissimo!